This sweet, creamy Eggnog Buttercream Frosting is perfect for frosting cupcakes or making sandwich cookies during the holiday season. Even non-eggnog drinkers like eggnog in frosting form! 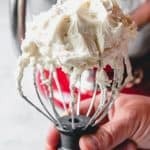 In a stand mixer using the whisk attachment, beat butter until light. Add powdered sugar and mix on low speed. Drizzle in eggnog or cream, along with the nutmeg and rum extract, then increase speed to medium-high and beat until light and creamy. Add additional eggnog or cream as needed to get a smooth buttercream consistency. If you don't have eggnog on hand, cream works just as well. You may just want to add a pinch more nutmeg and an additional drop or two of room extract.